The folks at Sonos are doing everything they can to make sure you are all aware of their new Sonos Controller app on Android and how it can turn your wireless home sound system into something really special. 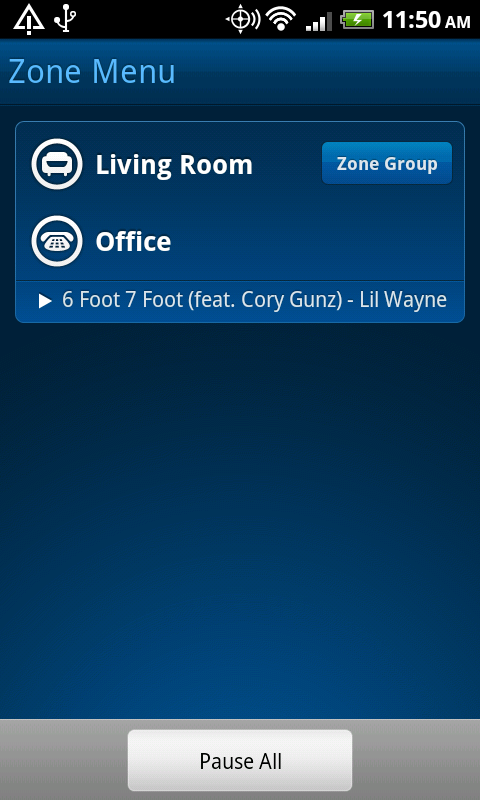 The app is now available for free and can power your entire Sonos setup from any room in your house as long as you are connected to your WiFi network. Multi-room control is something I hadn’t imagined before receiving a bundle of products from Sonos, but I’m now trying to imagine how I could ever live without it. Background. A couple of weeks back, Sonos sent out one of their wireless home system bundles to us which includes two S5 units and a ZoneBridge, so that we could set up a multi-room system and give their new app a proper run-through and share our thoughts on it. A Sonos S5 is a high performance, all-in-one, 5-speaker music system (2 tweeters, 2 mid-ranges and 1 subwoofer) that can be paired with multiple units, giving your house a simply brilliant sound setup. A ZoneBridge is the wireless connector between S5s, allowing you to wirelessly power multiple devices from various rooms that you may not have network access to. The entire bundle can be purchased together at their site for $798. Setup. The set up for this bundle was a breeze. After opening each box and placing each piece in the room I desired, all I had to do was install some quick software on my PC, click a couple of buttons and start jammin’. 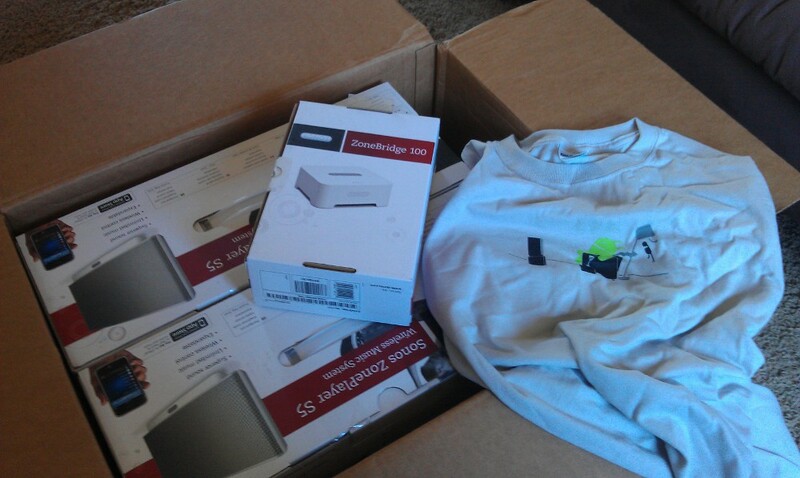 I placed one S5 in my office, the other in my living room, and the ZoneBridge next to my wireless router. Sound. Since I’m no audiophile, and am not about to act like one, I’ll just say this: these S5s are insanely crisp and clear. In fact, they will be the go-to music option for my entire house for the foreseeable future. 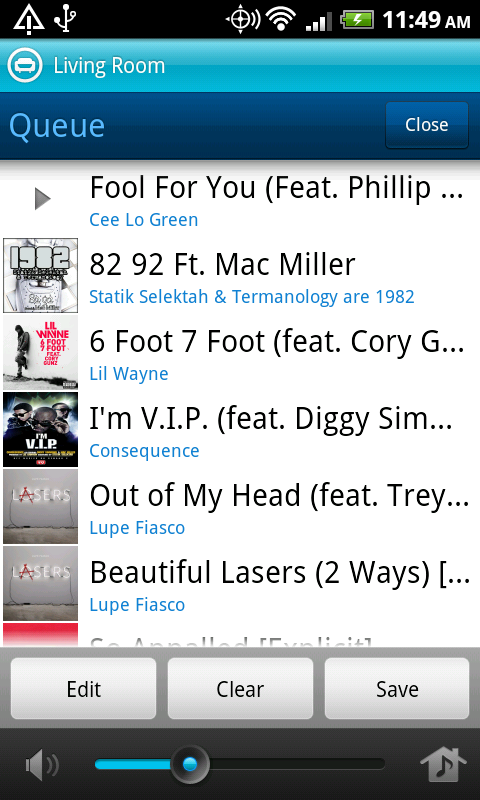 Part of that has to do with the amount of control I can have over it, but most of it has to do with the sound quality. I would be surprised if anyone wasn’t impressed by these. And I’d attempt to go into detail on how amazing they are, but this is really about the app isn’t it? 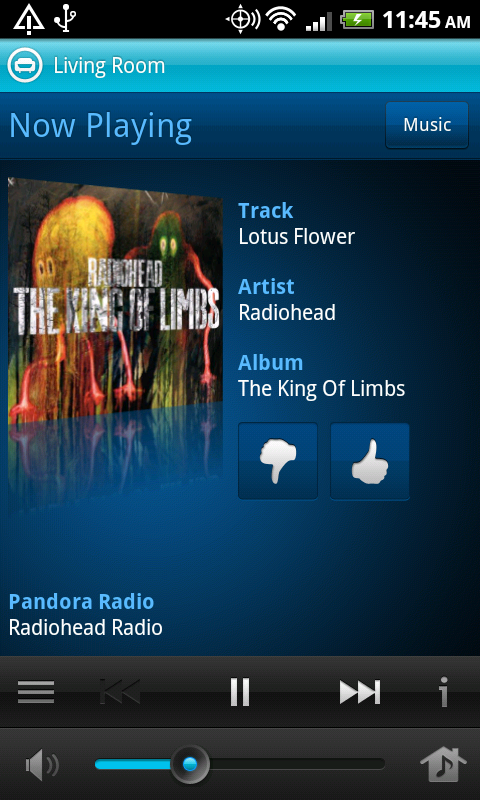 Sonos Controller on Android. So the app…how does it work? Let’s jump into some visuals. Actually, the first thing you’ll set up is the PC software which gives you ultimate control. As you’ll see in the picture below, you can control the different “Zones” you have set up individually or together; my two “Zones” are the rooms I have my two S5s set up in. Once you have that set up though, it’s time to get the app up and going. After downloading it from the market, I pressed a couple of connection buttons and the entire system was then accessible from my phone. I had complete control over both “Zones” in almost the exact same way that I did from a PC. 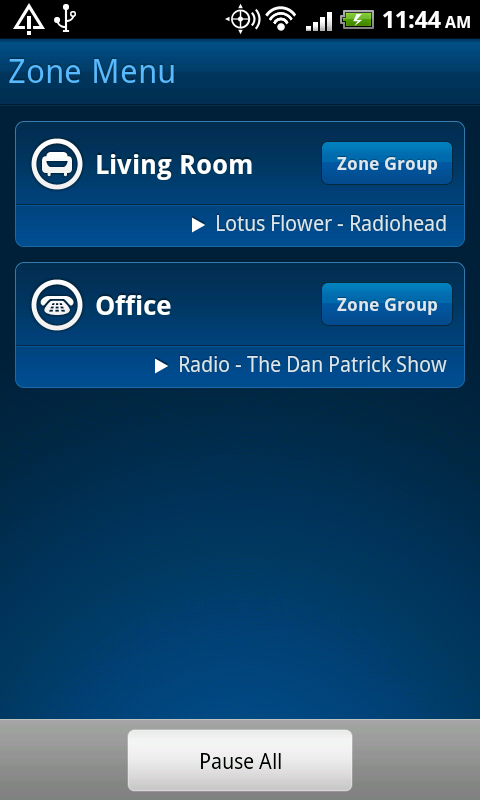 You can set up one Zone to play from Pandora and the other to play from your music library, both from the same service, or even just use 1 at a time and turn the rest off. 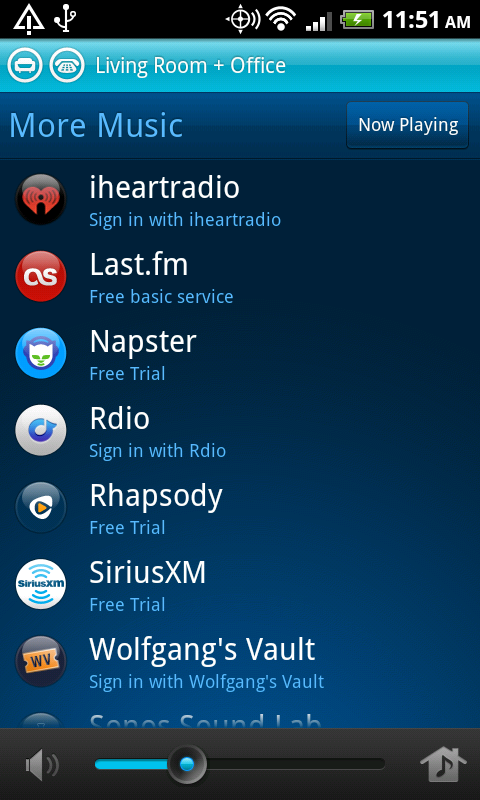 And as I mentioned earlier, you have access to services like Pandora, but you also get iheartradio, Last.fm, Napster, Rdio and the list goes on. 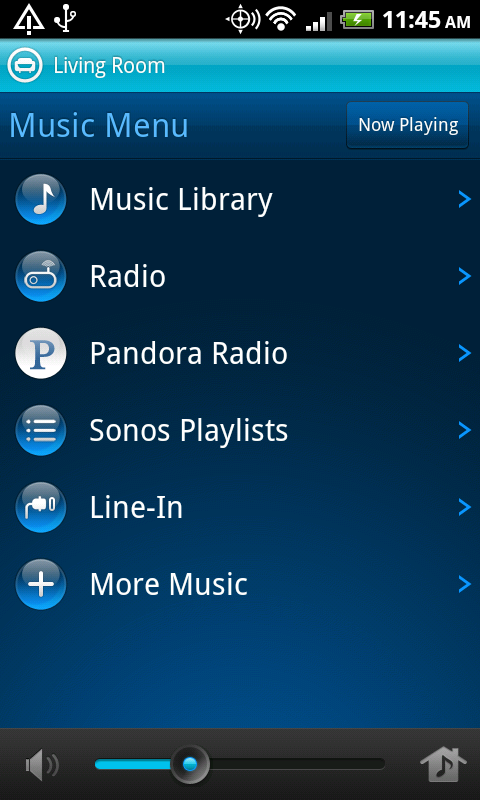 You can view your own library once you’ve allowed Sonos access, but can also turn on Radio stations from across the country or even shrink the list down to your local favorites. 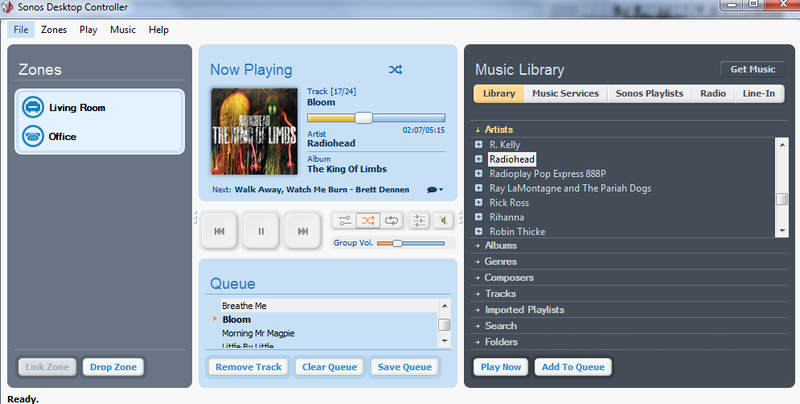 You can set up a queue of your favorite music for parties, adjust the volume level in each room, and do things like browsing by artist. Overall. 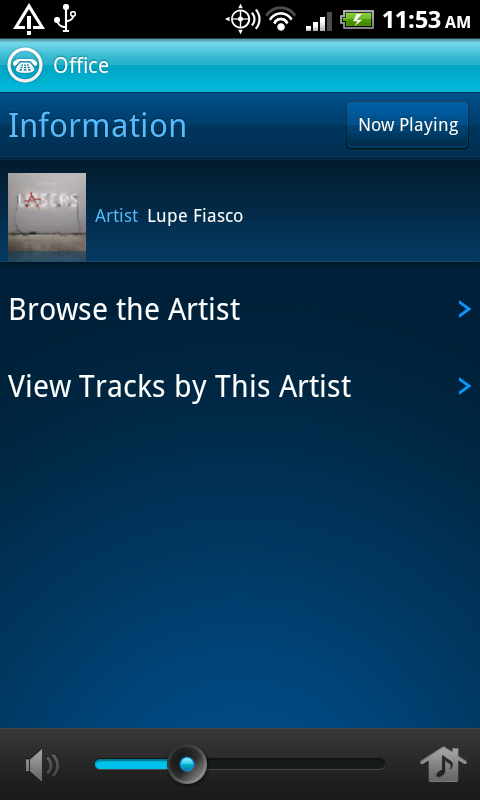 It’s hard to deny that this is one of the most impressive Android apps to date. No force closes, was a breeze to set up, it has an incredibly polished UI, has the full functionality that is seen on the PC controller, and is more-than user friendly. Pair the Controller with a set of S5s as an entire system and you have a musical force to be reckoned with. Assuming you can afford it all that is. This is definitely not meant for the average music lover. Well, I shouldn’t say that. The system will sound amazing to everyone, but as a bundle for $798, we can see it not necessarily matching up to everyone’s budget. 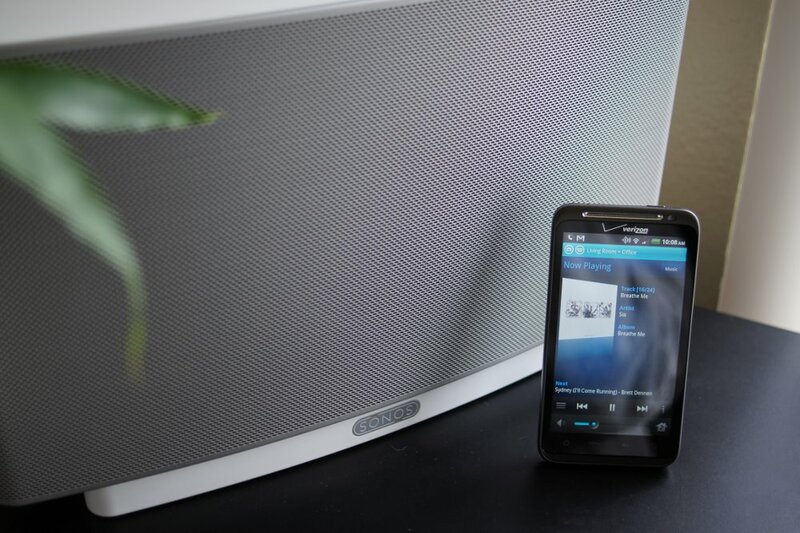 So I’ll say this – if multi-room high-performance music is something of interest, I highly suggest that you stop by a local high-end music store or even a Best Buy to hear a Sonos system for yourself. You definitely won’t be disappointed with the app, but we all have different ears, don’t we?